We use two March 809/815 pumps with stainless steel pump head housings in our brewery. This is a tough little pump with a 1/25 hp, continuous-duty 1.4 Amp motor which can be run non-stop for extended periods. It has no problems handling boiling liquids as the pump is rated to 250F. Recirculate water in the Hot Liquor Tank (HLT). Transfer strike water from the Hot Liquor Tank to the Mash/Lauter Tun (MLT). Recirculate sweet wort in the Mash/Lauter Tun. Transfer sparge water from the Hot Liquor Tank to the Mash/Lauter Tun. Transfer sweet wort from the Mash/Lauter Tun to the Boil Kettle (BK). Transfer wort from the Boil Kettle to the wort chiller and on to the fermenter. Some of these tasks are done simultaneously (1 & 3, and 4 & 5), hence the requirement for two pumps. We chose to use stainless steel pump head housings (instead of the more common plastic/polysulfone housings) as the stainless ones are nearly indestructible. Stainless steel is used in professional setups because it is a durable, food-grade metal that can withstand caustic chemicals and can be effectively sanitized. 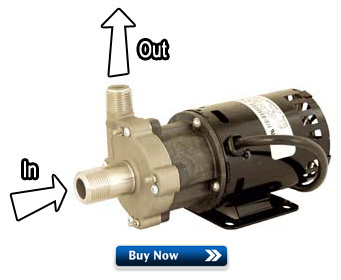 The pump's magnetic drive acts as a clutch allowing us to put backpressure on the pump to control liquid flow. We do this by placing a ball valve on the output (never the input!) of the pump. This is one major advantage of a magnetic drive pump: They are perfectly safe to run with the output completely blocked, completely stopping the flow of liquid. You won't harm the pump motor. One disadvantage of magnetic drive pumps however is that they are not self-priming (they cannot clear air in the input lines by themselves). 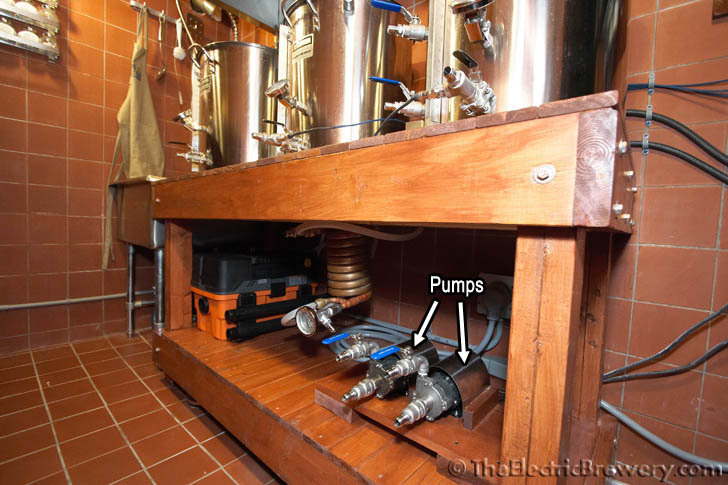 This means that these pumps must be placed lower than the liquid source so that gravity feeds the pump. The liquid sources in our setup are the three kettle outputs on top of our brew stand. Our pumps sit on the lower shelf so gravity feeding is easy. These stainless pump heads also have a larger 3/4" center positioned inlet (as compared to the usual 1/2" bottom-positioned inlet) which makes priming even easier still. We have never had any issues with priming our pumps. We simply open up the ball valves and liquid flows straight into the pump head. The pump is then turned on and liquid is pushed up and out. 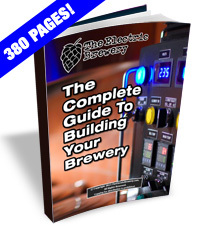 A common complaint from brewers with standard 1/2" inlet pumps is that they require extra work to prime through specially installed bleeder valves and/or by playing with the hoses. While these pumps come pre-lubricated from the manufacturer, they should be lubricated again every year or two. Our pumps come with a bracket so that they can be mounted. We'll be mounting the pumps, attaching quick disconnects and a ball valve, and then replacing the power cord plug with a locking plug to avoid accidental disconnection. Cord length can vary between pump manufacturers, usually from 3-6 feet. Ours are 6 feet long and are just long enough to reach the control panel. Need a longer cord? Add a pump extension cord.